From birth, use the 3D hip seat to support your arms when carrying your baby. (Infant Insert available, sold separately). When the baby has strong neck and consistent head control, used the 3D hip seat + double shoulder to wear your baby facing in and be hands free. Forward Facing with HIPSTER™ PLUS is safe and fun. 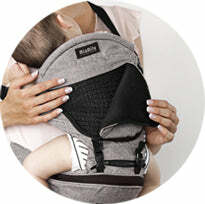 Our 3D hip seat ensures your baby’s hips are always supported and legs don’t dangle..
Back carrying is a great option for heavier babies as it's more comfortable for the parent's back and allows more mobility. In some babies, the ball of the thighbone doesnt fit securely into the hip socet. And if their hips are stretched out too much, you can distort the cup-shaped socket which can cause problems when baby starts walking. No carrier can cause hip dysplasia if it is not already an existing condition for your baby. But correct hip positionning is a smart way to make sure your child cis comfortable and developing properly. Forward facing seated position is safe starting at 6 months old. This carrier is amazing!! 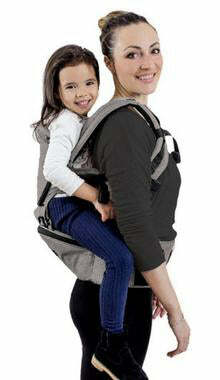 My sister in law had this carrier for her kids, and now I'm awaiting mine in the mail! I purchased my Hipster last year my baby is currently 5 months. I love it she is so comfortable in it and I'm so glad that it is also comfortable for me. I have to tell everyone how amazing this carrier is. It's definitely worth every penny just buy it. So far we’ve only used it a little bit Bc my son is very small and in between needing the newborn insert. But so far we love it! Takes a lot of weight off my shoulders. We have used the original hipster and the hipster plus, with and without the infant insert. A great carrier. We had a problem with the zipper breaking on ours, but we love it so much we definitely wanted to replace it. I've carried kids up to about 30 pounds (they started revolting after that), on my front and back. I have chronic back and neck pain, and this did not aggravate it. I've even been able to carry both kids at the same time!! Definitely worth the money.